Well this is the last week of the transfer and we know that one of us is going to leave Boliver. Oh I heard that there is some confusion as to where I’m at. I’m in the city of Bolivar in the Provincia of Buenos Aires but my zone is the Zone of Olavarría, so I go to Olavarría every Monday so because of that I tend to talk about Olavarría a bit. Well it’s been a couple of trying transfers for me. It’s really sad to see people who don’t want to realize their potential. That is exactly what I’ve had to deal with all this time here in Bolivar. However this has really made me realize what potential we all can have. We are Children of Our Heavenly Father. He loves us and he wants Lo Mejor (the absolute best) for each and every one of us. We have to do so little in order to achieve all of this potential, to receive all of the blessings God has for us! What an amazing thing it is to be a member of his church and to have that knowledge! I’m very thankful for the opportunity I have to share that with everyone. This week was amazing and also more of the same. We had divisions and I have to say it was nice to do a little bit of work this week. After that we got to listen to Elder Bowen. He is the President of this area, Argentina and Uruguay. He talked a lot about obedience which is something that everyone needs to take more seriously. If we're all obedient the world will be a far better place. I heard about the bug that's been going around up there, right now it's really hot in Bolivar. I don't have any time left but remember the Lord loves us and that is why we have commandments! What a week! Due to the robbery we have to change apartments so we did that this week and we didn't seem to do much more unfortunately. Well I heard you have some days with temperatures in the 20's that sounds like something I don't really miss. It was below freezing one day since I've been here. It was in my last area and there was a little bit of snow but it didn't stick or anything but all of the people were in their houses staring out the window "enjoying" it because it's not exactly something they ever see. As for me, after this last crazy winter I'm fine with no snow for a couple of years. Now however it's about the perfect temperature probably around 70-80 degrees, but I'm not really sure but it's nice. Also one thing about here that is probably interesting is that it is almost always windy and I mean always. This in combination with their dirt roads which is actually really fine sand makes for perfect conditions to have tons of dust in the air. Also because of the humidity we have a lot of storms and for those of you, who've been in Spokane forever, not rain like there, but real pouring down rain. I didn't know it could rain so much. They have little canals everywhere especially in the barrios where the dirt roads are and they fill up in so little time. It makes it really fun to get around jumping over streams in the streets and gigantic puddles of mud in the barrios. Thankfully Bolivar is really nice or lindo as they always say here so it's not too bad. This week Elder Bowen the Area President is going to be here in Olavarría to talk to the missionaries and the members. I'm really looking forward to it. Hopefully I'll be able to get some pictures of Bolivar before I leave as one of us is going in a couple of weeks so we'll see who it is. I've been reading the old testament really fast when I have extra time, which I shouldn't ever have, but it's there now so I might as well use it. I found out that Moses was supposed to talk to the rock to have it bring forth water the second time (see Numbers 20:2-12). Instead, he just smote it and for that he and Aaron were denied the privilege of entering the promised land. There are a lot of lessons in this. First how many times do we think that our way is better or easier, when really all we're going to do is deprive ourselves of blessings that could have been ours because we were trying to do it our way? Second the Lord wants us to progress. The first time the Israelites needed water he healed the water that was already there. The second time he smote the rock which requires more faith right. The third time he was told to talk to the rock where still more faith would be required. Moses lacked the faith the third time and did it the old way rather than stretching himself and obey a new commandment. For that, like I said before, he was denied entrance into the promised land. It is the same with us; we need to ever improve in order to enter the promised land or God's presence. I want to progress! The scriptures uses the word damned a lot. This is more literal that we might think; a damn stops water from progressing right. That is what eternal damnation is, the stopping of progression. Let's all strive to be better and progress to grow and to learn from every experience we have! As you might now know there was a robbery of our apartment. Here is how it went. We got home way late one night as my companion is always spending tons of time in members home when we shouldn't be doing that. We get in and I went to the bathroom and he went to the bedroom and saw broken glass. Then someone opens the door and comes in with a flare gun and points it at him and starts asking him for very specific things. The other one had a wooden pole and was telling me to get down to the ground but he was all drugged up and I couldn't understand him. So I was saying the best I could, "what do you want, I can't understand you". That was pretty funny and you could tell I was really calm especially given the circumstances. I finally understood boca and pisa or mouth and floor. Oh ok you want me to get on the ground ok. So I did that and they took some stuff then left. During all of this I was really thinking man I'm probably not going to be able to sleep tonight very much and was kind of annoyed because of that. And we didn't call the cops. Here they are not like they are in the states. Be thankful for them, they're amazing there. My companion was ticked because they took a bunch of stuff from him that he shouldn't have had like his mp4 player and other stuff. I'm kind of glad for that. I was really calm and I take that as from God indicating to me that "you're doing your best given all of these hard circumstances with your comp and everything, so I'm going to bless you with peace." I'm still rather calm though I'm annoyed as my comp is using this as an excuse to not work at all, so we did nothing this week. There is a blessing to that as I do have a lot of study time. We have Elder Bowen of the Seventy coming and he is apparently really hard on missionaries. Maybe he'll guilt my companion into doing something, so I'm very excited to hear what he has to say. We found a new apartment and are going to move in Wednesday and we have a zone conference tomorrow. Interviews I can't wait! General Conference was amazing, I loved it so much, it was so spiritual and I got to listen to it in English and that was kind of nice. The talk that may have applied the most to me right now was the one on temperance. I don't think I am as humble as I should be and I'm not as patient as I should be and right now I have regular glass protecting me. I need to have tempered glass so that when Satan throws stuff my way I won't be injured, but rather be protected and just continue on in the work of the lord. Also the talk by Elder Holland was very strong, what an amazing talk. And President Uchtdorf's talk about love in the first session was really powerful. Also that talk from President Monson; "what good thing did you do today and ask it every day" is a great thing to do. And lastly what good advice Elder Ballard gave on interviews or something. Thanks Dad and Mom for all of the gospel stuff we did before I left. I really appreciate it now. I know that it's my preparation from you and fantastic leaders that is what is keeping me motivated to be obedient despite the circumstances under which I'm in right now. Thank you. 2 NEW PICTURES HAVE BEEN POSTED TODAY. Dad, Happy Fathers Day, Happy Birthday and Happy 4th of July! The trek sounded like it was a ton of fun and that was similar with me I had a blast! Can you send Jeff a happy birthday it was June 6th but as soon as I got here I forgot. How were Sebring’s and Acea’s grades? This week was well, slow, as my companion didn't really want to work. We however got transfer calls and had transfers so I’m staying in Rauch and Elder Kenny is now my new companion. He is from Ogden and he dies (is going home) in two transfers. I'm really excited for this transfer. Rauch is starting to shape up in terms of stuff happening in the work and now that I have a companion that really wants to work. We are going to, well WORK! Also he cooks and a lot and really good which I’m excited for because everything is a little different down here so I don't know how to make anything. The first transfer, I had a lot of bread and dulce de leche. So I’m really looking forward to learning how to cook all of this argie food. I have pictures of Rauch so all of you can see. However the computer here is well not very accessible and I can't find out which ones are which so I’ll get them to you as soon as I can. I do have a story for all of you. When we were in Mar del Plata there are these little cement sidewalks if you will that go out into the water so we wanted to get a picture with the water splashing behind us. So we go out do that and then this way big wave comes as we finished and soaked us to say the least. It was really funny. We also have pictures of it. I’m in the back because Elder Peterson and Hermana (sister) Fierro saw it first and more or less pushed me out of the way so yeah it was interesting to say the least. That picture however is amazing. As for the work, Rauch is really starting to pick up. We have this fantastic kid in the Rama (branch). His name is Augustine. He is really strong in the church but he can't get baptized because of his mom. So I finally convinced my companion to go there and talk to her. And she isn't really opposed to it, now that we told her what baptism is about and such. She also wants to learn more. Also we have a small family of three that know it´s true but for a while didn't think baptism was for them. But now they all want to get baptized. They're going to be doing that soon, so I'm really excited. It is amazing to see the Lord work on these people and in their lives. They have so much more peace and joy in their lives and they don't yet have a fraction of the blessings the gospel brings. Thank you again for your love and support and if you want to write me you can use DEARELDER.COM. It actually only takes about 15 days to get here. Today we’re at an internet place that doesn’t like my camera too much, so no pictures this week, lo siento! The question was asked about food I normally eat here. Apparently in this area I’m in right now there isn’t as much meat as there usually is, so I have a ton of noodles in a spaghetti type sauce and always with bread. They love their bread, that’s for sure. I once had this stuff that had the consistency of applesauce and looked like it too, but tasted like, well I don’t really know, but it had nothing to do with apples. It was kind of like grits, but I enjoyed it. Also they love to boil vegetables. They are really good and really filling. They always have soda and I mean always. They don’t drink anything but soda and mate. Mate is this drink that is hot and they put this ground down plant and sugar in this cup with a straw type thing. I can’t remember what it’s called right now but it filters the pant so it is just the water, but they drink it all of the time. They drink it in the morning, for lunch, for dinner and in between for when people are over and even when they aren’t. If there was anything that is or could be identified with Argentinians, it would be mate. There is this other sweet stuff too that is called dulse de leche or directly translated sweet of milk or sweet milk. It is amazing! It is on anything and everything bad for you hahaha. Sometimes I’ll take some crackers and put some dulse de leche on it. It is kind of like caramel but thinner and tastes way better (I am a bit biased in that I don’t like caramel very much). Well that just about covers the food question. I was also asked about the laundry. I was told before I went out that I might need to do my laundry in a bucket. Well, happily it is very convenient here. We just show up, give it to them, and someone who does it for a living will do it all really nice, I might add, and really inexpensively. Just 20 pesos (a little over $5) for two weeks of laundry. I heard that the youth worked hard selling asparagus this weekend to raise funds for their summer activities. I’m glad it was successful and especially for the learning the principles of hard work and gratitude. There’s nothing like hard work to make you appreciate more what you have. Here in Argentina, some missionaries will get to serve in an area called Mar Del early in their mission and they will get tons of baptisms. Then after that, they begin to think that they don’t have to work too hard in the Lord’s other vineyards. But you always need to work hard. I really feel for Shane not being able to go on the trek. I believe of all the stake youth activities I participated in, that it was probably my favorite. I made me again appreciate so many things. Not too much else is going on right now. My companion didn’t really want to work this week. So whenever I actually got him out of the house he just would go to member’s homes and talk for a long time. So I get a lot of study time because of him and I’ve been reading Jesus the Christ which is the most amazing book. I love hearing about the Savior especially in that detail because now as I read the New Testament, it makes so much more sense! My testimony has been strengthened because of that book! My dad shared an experience he recently had that again demonstrated the power that the Spirit can have. I also would say that the spirit is incredible, no doubt. Whenever I have the spirit, I can speak Spanish good enough to get my ideas across, which is nice. I just need to work on getting it strong enough to do that all of the time. NEW PICTURES HAVE BEEN POSTED TODAY. Acea that is hilarious and I can see Mr. Moore play a practical joke like the one he did to Justin hahaha I got a kick out of that. A funny thing just happened. One of the elders in my zone just walked over and said what is that word? I know it, but I don’t know what it means. (He’s been out here a long time) and the word was Acea. So I started talking about this word that I was making up on the spot so that was funny hahaha. I eventually told him it was my brother’s name. Thanks for the story I got a kick out of that. Now to answer some of your questions. I haven’t had and reactions to the food or water. Those way too expensive gloves I brought; they work, but they don’t help as much as I would like as my hands are always cold but it’s not too bad. My feet are fine as long as I’m walking and stuff but man I love the thermals. I found a thermal top in the apartment that was from the last missionary here and he hadn’t used it once, so yeah, I love thermals! As for the rock I previously sent a picture of, there are actually two really cool rocks. The one that I sent to you is the other cool one in Tandil. We went to the Piedra Movediza rock today and I included a picture of it. It is actually fake. The real one fell in 1912, but two years ago they put up a plastic fake one that is the same. The first one is a lot bigger but it isn’t really about ready to fall off but it is too on a cliff. Another question I’ve been asked is do we observe siesta and the answer is a resounding yes. So I don’t really know why, probably because during the summer in the northern parts of Argentina it gets really hot, so they all go indoors for the hot part of the day. Here even though I see no practical reason for it, but they do it to. It starts anywhere from 11:00 am and usually ends at around 4:00 pm. It is frustrating, especially right now as it is the warmest part of the day. But the people here come home, eat, and then sleep. So our daily schedule is as follows; we have less study time in the morning, and we get out of the apartment at around 9:30 am. We work until 12:30 pm, if I can convince my companion to work that long, which doesn’t always work too well. We then have lunch with the members, which in Rauch, we get every day except for Sundays. We then go back to the apartment and I study Spanish and my companion sleeps. In the bigger cities of Bahia Blanca and Mar del, and in two other areas, we can work during siesta doing street contacts, but during that time, if you knock on peoples doors they don’t like you very much, that’s for sure. I heard from Sister Jones (thanks for the letters by the way) that it is really nice up there. Here, it is early winter and I can’t believe school is already out down here. They started about the time I went into the MTC which was in March. Also our “stufe”, I think that is how it is spelled, but it is kind of like a really small furnace is broken so our apartment is really cold all of the time. My first week, my bed broke when I was rolling over and the side beam just spilt almost all of the way down. So I’m sleeping on a mattress on the floor. Ah the life of a missionary. I love it though and the people here are so nice! They’re just amazing. I want to help as many of them as I can. Well we also had interviews with the mission president this week and it is his last and my first so that was interesting, and he also speaks about as much English as I do Spanish, so it was very short hahaha. We also had a district conference for the district down here and it was a broadcast to all of Argentina and it was needless to say all in Spanish, but there was one talk in particular that was really interesting to me. It was Russell T. Osguthorpe the new president of the general Sunday. He talked about how when he was younger he had to go too all of his meetings really early. Get ready to laugh, a half an hour, sound familiar, hahaha. (For those not familiar with the Sands family, a half an hour early is almost late) So he was talking about my family in away too. He talked about how there would be no one there and so they would fix hymn books and set up chairs and such wow! But I’m really thankful for those opportunities to sit and listen to the spirit. I love having the spirit guide my life as a missionary, it is amazing. We’ll do stuff that doesn’t sometimes make any sense or we’ll get lost and our town is really small and we’ll run across someone that will need our help, so yeah it’s amazing! I know this church is true. I’ve seen too much, I’ve felt the spirit too much, to deny it! Thank you all for you love and support! SOME NEW PICTURES HAVE BEEN POSTED TODAY. MORE SHOULD BE COMING, HOPEFULLY NEXT WEEK AS WE FIGURE A WAY FOR ELDER SANDS TO DUMP ALL THE PICTURES FROM HIS CAMERA. Well the file transfer method I was going use to send all my pictures didn’t work so here are a few pictures in the mean time of me in Tandil as I don’t have any of Rauch yet, plus a few other pictures. That’s great of the seniors graduating from seminary and especially Sister Ax doing it with 100% attendance and congrats to you too Bro on getting another 100% year but especially the memorizing of the Scriptures of the New Testament. Knowing the scriptures now will help you later. I’m still trying to deal with my companion. Even though it is tough to be with him, I’m being a good example whenever I can and trying to give him hints to be obedient whenever possible. Today I went to the second biggest statue of Christ in the world, so I sent one of the pictures of that. It's really big! This week went well, but yesterday was kind of a letdown. We had a whole bunch of people that were supposed to be going to church but didn't because of excuses. It´s really kind of sad. They know that these things are true, they've have had the witness from the Holy Ghost, but still they don't want to change their lives. They're afraid of the change even though they know that their lives will be better. We also have another boy of about 14 that comes every week and does everything, but can't get baptized because his mother won't let him. The only reason she won't let him is because his grandmother won't let his mom let him because she is catholic. A lot of people down here say “soy catolica” (I am Catholic) but they never have done anything with church except being baptized as an infant. Due to this blind commitment to something they don't really believe in, they are just depriving themselves of the blessing of the knowledge that God is the their father and that he loves them each individually. I know that God loves me and all of us. And because of that love he sent his son Jesus Christ and he has the church and everything that comes with it to help us in our lives here on earth. A lot has happened! We're working with one lady in Rauch right now and I think she'll get baptized before the end of this transfer. She is great and loves to hear the gospel. She actually was not progressing. Before my companion and his previous companion had been teaching her for about a month and she wouldn't read. So we were going to go back one last time and that was it no more after. So this is more or less the story she told. She was running out of money because she had lost her job and one day she just couldn't sleep. So she says ok I'll read. She reads from 3 - 5 in the morning, she gets a job and things start to work out for her which is fantastic. She now is progressing. She came to church and is doing great, although she didn't come this week because she was sick. We went over there and she was really sick! The weather down here is not too bad. It dropped down really suddenly which is annoying but it's not bad at all. My hands are always cold but that's about it. Today for p-day we went to this giant rock that is balanced on the edge of a cliff. It was pretty cool and I got pictures which I'll send next week. I forgot my cord. We had divisions this week which was amazing. 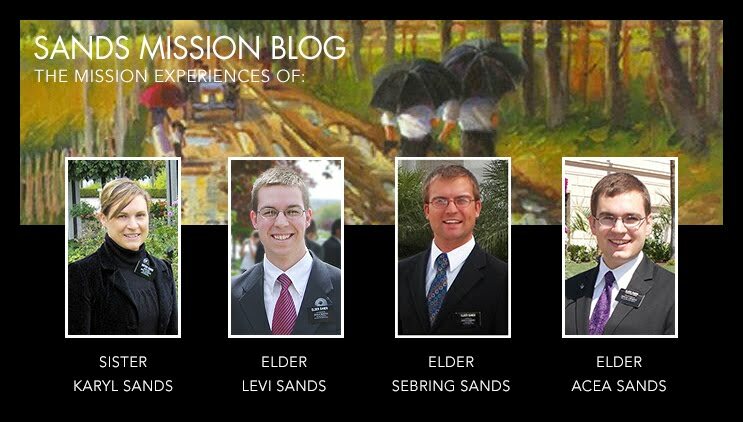 The missionaries I went with were really hard working. They don't use any excuses. Let me tell you about an experience. We were lost for a minute and so we decided to knock on a door because the elder I was with said that he does that whenever he needs to find someone. So the first door we knock on (or I should say clap, yeah we clap here) a lady comes out and she gets really excited. She lets us in and says that she is a less active and that has been praying for someone to find here because she has wanted to come back to church. Also that evening I was with another elder from Arizona but we were not terribly successful, but we worked really hard. So now I'm trying to get my trainer to do the same, he's a bit lazy when it comes to rules and working. Anyways I'm fine and working.